Monsieur Pot de Vis, What Have You Done For Me? Like the beeswax I picked up for almost nothing last month, I snagged a jar of old screws about a year ago when I was at an estate sale because it seemed a deal too good to pass up. 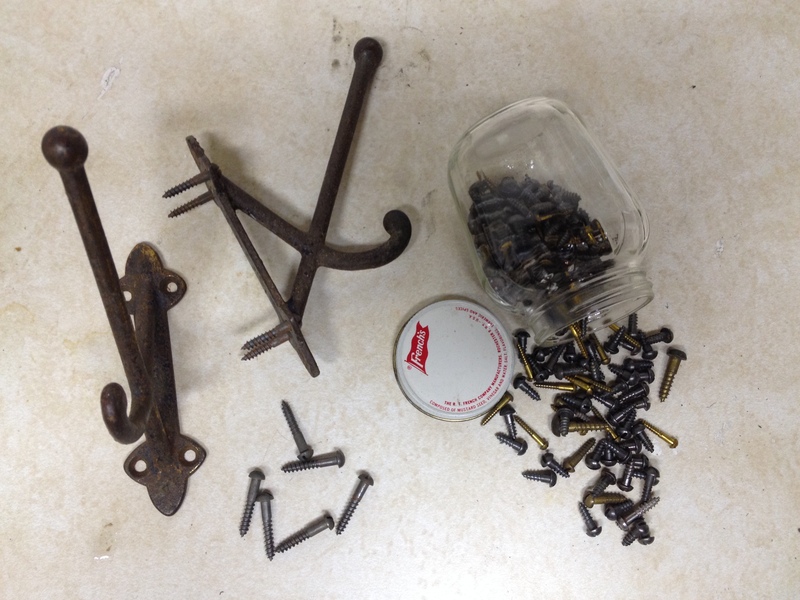 I had no immediate use for the screws, but I knew they were old, and old is better when you’re talking woodworking screws – older screws often used stronger steel and stronger steel means fewer broken screws and cammed-out heads. Last month, I was trying to clean up the clutter-bench (relic of the previous owner; it isn’t useful for anything besides putting stuff on, so that’s what will happen until I tear it down and remove it) and I spotted the jar. I picked it up and stared at it for a minute, wondering if it was something I really needed to keep or if I’d wasted a dollar. I put it back down, thinking I’d hold on to it a bit longer. Now we have to go back in time, about six months, to pick up the thread for the rest of the story. One day early this summer, I was looking through the inventory of a store on my most frequented on-line auction site. I’d picked up some antique hardware from them in the past and I wanted to see if something there might strike my fancy for a future project I had in mind. 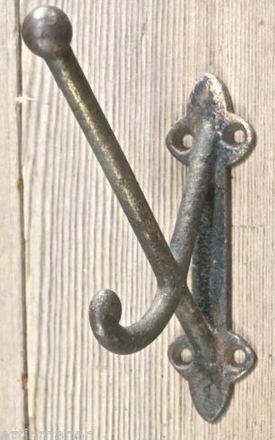 I came across just the thing I wanted – an old, cast iron coat hook with some nice detail work. It even came with mounting screws! They only had one listed, so I bought it. The next week, the seller listed one exactly like it. Dang; wish I’d known that before! I contacted them to find out if they had any additional ones, but they said no. For some reason, though, I didn’t immediately buy the second one. I saved the listing and sat on it, thinking. I do that sometimes and, after a few months or a year, I might delete the listing or suddenly buy it because I finally have it figured out in my head as to whether or not I’ll use it. That’s just how I work. This second coat rack sat in my Saved Listings box until last week, when I had some extra funds handy and I’d finally decided to go ahead with the project and bought it. When the package showed up, I pulled the coat hook out to give it a better look. It was just like the other one – old, cast iron, exact same casting, with remnants of a bronze wash on parts of it – so much so, that it is easy to assume they were together in their previous home, as well. Almost like a cartoon or a bad comedy, I squeezed open the manila envelope it came in and turned it upside down to get the mounting screws. And nothing came out. I couldn’t stop myself from looking inside to confirm it was empty. Indeed, it was. No screws. Dang. M. Pot de Vis saves the day! Congratulations, Mr. Jar of Screws, today you have earned your place in my shop. Post Script Edit: The coat hook project is something for my own shop. I want to do something that is MORE than just a board with some hooks screwed to it. I have an idea forming, but if anyone ELSE has any ideas they’d like to put forth, I’m all ears! Gotta love it when a plan comes together! I try to be mindful of these odd coincidences (what you call a “plan” hehe) when they happen, because it seems to be a fairly frequent occurrence! It’s always fun to take note of them when they do! Nice! I usually end up laughing at myself because the jar would be thrown away a couple of days before I needed it.